This past weekend when visiting my friend Ruth…I realized how much I lack the very thing I experienced while at her home. 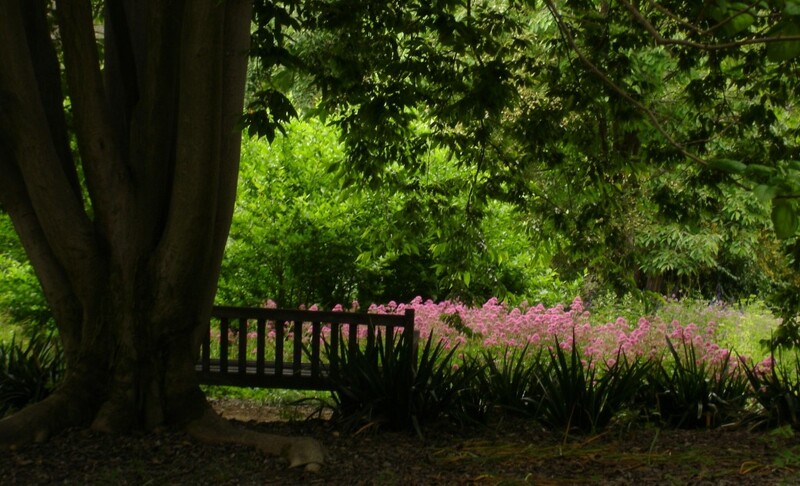 From the moment I walked in…a sense of peace enveloped me. It was so recognizable that I felt as if I could reach out and touch it. 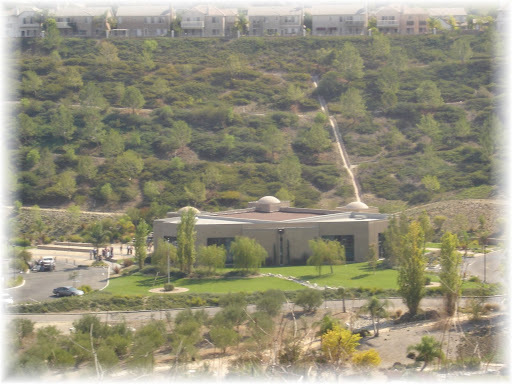 When I commented about it to Ruth…she mentioned that the peace in their home was God answering their prayers and desire to have peace reign in their hearts and home. 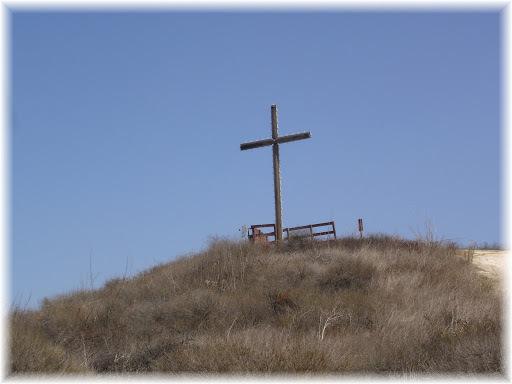 I am most fortunate…because I can actually walk to the foot of a cross our church property. While symbolic…in certain respects it is very powerful in bringing me into the presence of my Lord and Savior Jesus Christ. That outward symbol is not something I need every time…but I surely did this time. Praise God…it was available to me. When I asked my precious friend Danita if she would walk to the cross with me…I was so relieved when she said yes. We chatted as we walked up the road. Amazingly we only encountered a little mud on the path left over from the prior day’s rain. But the steep hill you climb up to get to the cross was dry and we were able to navigate it with ease. I just love the walking up to the cross. It’s so peaceful and quiet. A big freeway lies below…but you would never know it with quiet that surrounds you. 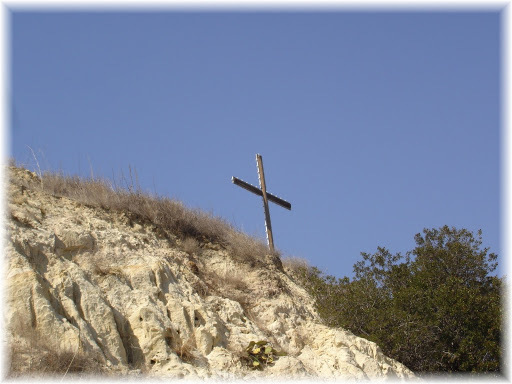 When we reached the cross…Danita and I looked down at our church…and we chatted some more. We talked about God’s faithfulness to our church and marveled at what He is doing. I shared a little bit with Danita about my struggle and asked if she would pray with me. I could feel God’s presence and it didn’t take long for the tears to flow as I confessed my lack of faith and desperation for God to intervene in my situation. I found that when I spoke the truth of God’s word…I was comforted and the tears stopped. Yet I was broken. Precious Danita prayed too…and her gentle and understanding words brought me much comfort. Thank you Jesus for bringing just the right person to accompany me on my trip to the cross. I very relieved after that…and God ministered to my heart the rest of the day. I thought I was done with God taking me to task regarding this episode. But I was wrong. Thankfully…when I need correction He deals with me in small doses that I can handle. A little bit at a time. Today’s lesson was peace. Even though I dealt with the issue my failing faith I didn’t see the outworking actions and consequences that remained. As I doubt God and who He is and the truth and reliability of His word…then I want to be in control of my life. I seek the counsel and wisdom of man…not God and His word. There is a fine line…because if I’m speaking with a Christian rooted and grounded in the word of God…I may receive godly counsel. But I may receive man’s watered down version of God’s word instead of the powerful word of God. That which is able to change lives and change people. That which is able to save the souls of men from hell. Why wouldn’t I go directly to the source? When I’m anxious and trying to be in control of my life…I have no peace. I’m trying to keep all plates spinning in the air. Then they start crashing in…one by one. Suddenly all around me everything is shattered, broken and jagged. It will hurt me when I step on it or try to walk away. Gee wiz…when, oh when, will I ever learn? God impressed upon me the verse from John 14:27…where Jesus tells His disciples that He will give them His peace. He gave it to them and He will give it to me too. Give. Give…if someone gives me something…I need to take it. I need to receive it. If my hands are full…and someone offers me something more valuable…won’t I set down that which is of little worth? Gladly and pick up that which is of lasting value from One who loves me. So why am I not taking the peace that Jesus is offering me? What am I holding on to instead? Why? What lies of the enemy am I believing? Even if I’m in the midst of circumstances I don’t want to be in and pray for God to change them…isn’t it better to have peace in the midst of those circumstances? But of course there is price…it means I have to be prayer. Hand over my circumstances. Surrender my will to God. Chance the unknown for that which I can never fully achieve. Why would I think that God would call me to something that would not have a price or a sacrifice? My gain, my reward for trusting Jesus may not be in the here and now. It may be later…and it may be in heaven. But it surly does have its residual rewards…like peace. I pay an infinitesimally small price compared to what Jesus paid on the cross to buy me that peace. Now that is an apt description of what I’m doing. I’m trying to dig my own well…only to find it dry or muddy or filled with brackish water. And I wonder why I still thirst? Jesus wants to offer me a fresh endless flowing river of peace. Something that will quench my thirst and wash me clean. Now why wouldn’t I choose that? I thank God that nothing is lost in God’s economy and that He is able to use my experiences and failures to help encourage others to not following down the same path. A path that will only cause pain and hurt…and possibly destruction if I remain on the wrong path. I’m so glad to know that He can use it for good. But for once…no more than once…consistently I desire for me to choose to live according to His word and that my choices might be an example on doing it the right way according to God’s word and by the power of the Holy Spirit within me. So Jesus…I give You over this mess of my life and my poor choices, my lack of faith and my failures. I ask You to please take it from me. Please exchange it for that which I can not do on my own. I ask You to give me wisdom…and fill me with Your love and with Your peace. Help me in my circumstances. Give me Your Living Water and I will lay down my broken, dirty, muddy cup. Jesus, You were with Danita and me at the foot of the cross. You heard my prayers…I give them over to You. My life and my situation is in Your hands…I’m asking You to work it out according to Your perfect plan. Dare I even ask for a miracle in this? Yes I do…knowing that You alone are able…more than able to accomplish what concerns me today. Praise God. It’s in Jesus name I pray…Amen!